Why VMGP Rocker Finger Bushes? In the photo below centre right, you will appreciate why we wish to increase as oppose to reduce circulation capacity. The VMGP bush is marked "I" with a typical modern repro bush marked "II" where the comparisons are visually apparent. Also note our bore finish. The photo below left also details our improvements. The scale drawing in the photo below centre shows the larger oil groove outlined in red. Note the green outline cup profile on the shaft (see also rocker shafts). In one of our engines, we have previously used stock item reproduction dural / aluminium alternatives. It is worth noting that whilst these continue to be retailed at a higher price than the brass alternative, the general opinion is that there is no real benefit to be offered apart from a nominal reciprocating weight loss. They have however, attracted adverse commentary over the years in that they do not retain the strength quality compared to the brass alloy alternative as they can readily 'crimp' onto the rocker shaft if the finger is marginally overtightened. This then creates excessive wear to the bush, fingers and cam. We recommend sticking to the original brass alloy type material. 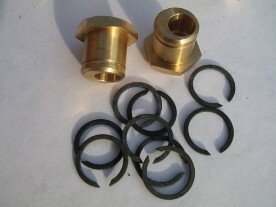 Our bushes are suitable for J, P, L, N and K Types. The M, D and F Types as well as OHC Morris Minors used an early style rocker finger which is no longer available. However, the later style rocker fingers are widely available from a couple of sources and our bushes complement such components. Our machining finishes are different to those undertaken on other modern bushes which are visually apparent to include the precision finish smooth internal bore, radii corners to all bore profiles (no burring), a deep oil groove and no fine machining chatter to the hex face. We also manufacture high grade Chrome Moly rocker shafts to incorporate milled cups within the oil delivery holes, similar to original factory L/K shafts.